Wonderful and inspiring message Irene! I applaud Dane for posting this, and I admire you, your daughter and your dog(!) for really actively putting it out there – it was a real pleasure to meet all of you in Toronto at the recent March against Geoengineering, and look forward to more events like that, which are being planned! Lets keep this ship moving forward for calmer seas! Just came back from a 10 day visit in the Pacific Northwest (within the US) with an old, close friend of mine. The air quality was markedly better out there than the Midwest, comparatively speaking. My own racing heart and palpitations actually ceased completely while I was there. There were less visible stratospheric aerosol injections, however, they were still present nonetheless. I'm back home now and visiting my primary medical doctor today regarding these other issues I've been having increasingly over the past few years. Doubt that will make a difference . . . other than being recommended to see another specialist (and other inconclusive lab testing) that doesn't accept the obvious ongoing geoengineering within the medical industrial complex, and/or most likely being prescribed another prescription to my current regimen of 'Big Phama Band-Aids' as opposed to actually looking at the root environmental impacts occurring, and increasing, over multiple decades. If they would simply look at the information and research openly out there, without bias or cognitive distortion and dissonance. The majority clearly needs to reframe the lens of which they perceive reality. Until then, status quo will persist . . . as most with current employment just want to make it to retirement without it being sabotaged by telling the truth, and doing right by humanity. Your personal story was very touching and inspiring. Thank you, Irene. I have been away from internet and didn't get to thank those who commented on my article. I want to express my gratitude for all the support I have felt here in this very difficult journey. Most of all I want to THANK YOU, Dane, for being that CONSTANT without whom I may not have persevered. We are all the PLANET and how we evolve influences how she evolves, there is no separation! Much LOVE to everyone and GODSPEED. This Earth has to be cleansed to create the New Earth. Hello Irene Parousis: I've awoken to many spiritual insights over the years – studied comparative religion, history, mysticism, archeology anthropology, and traditional Pagan belief. I spent thirteen years in daily meditation pondering the five elemental forces as represented in the Book of Changes (I Ching) I've studied many philosophical traditions and consider myself as atheist/Pagan. I would guess that most readers will not understand my message. Scientists claim that climate engineering programs will reflect the suns rays like a mirror, well they are right about that much; the sky has become a giant mirror but the sun is not really it's reflection, it is us. Everyday, I hope that people who observe and acknowledge the white-out trails in the sky will come back to themselves, because that's ultimately what this is in the grand scheme of things. 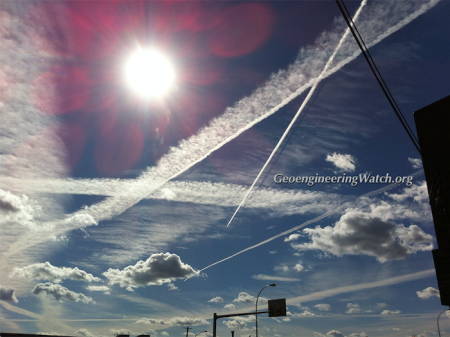 To deflect that responsibility is no different than those who think we can "geoengineer" our way out of this. Thank you, Dane, for sharing my moms personal experience in this battle and journey. The message is an important revelation, I believe, all should reflect on. Thanks for sharing your story, Ms. Parousis. 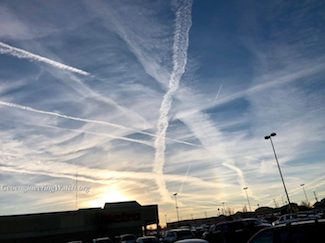 You shine a bright light on the importance of establishing strong personal connections with others who understand; with whom we can discuss any aspect of the geoengineering madness over the long haul. Everyone probably needs at least one person for that purpose. That's especially true when so many of our families and friends insist on total denial, as they obstruct us from even starting a rational discussion about the blatant aerosol spraying/ground-based electronic manipulation occurring above and all around us. I fully concur with your emphasis on our daily consumption choices. Still, we must never lose sight of the fact that, 57 years ago, President Dwight Eishenhower warned us about the "military industrial complex." This very conservative Republican, and impressively decorated war veteran, perceived a "disastrous rise of misplaced power" in the military that "exists and will persist." All these years later, in both Canada and the United States, the individuals who are making these decisions must be held accountable. Military planners and their (private) corporate partners, without any public due process, are using our tax dollars to finance the geoengineering operations. They are being deployed on an unbelievably massive scale and poisoning all living things. Canadian Parliament and U.S. Congress members remain unanimous in their despicable silence, even though they are perhaps our most key allies in this difficult struggle to raise awareness. As we do our individual parts, only they have the power to halt such secretive and criminal operations without delay. Today was farmers Market #6, 18 more to go, 'this year'. Again, today was a very successful awareness function, "on the streets". I had another visitor that stopped by today because he had seen the banner facing the street the week before and had attempted to look up "chemtrails"(I very much dislike that term) on the internet. As you all know, he didn't come up with anything substantial. I commended him for stopping by and allowing himself to be given credible info for further investigation. I don't give it to everyone, but he got the full meal deal of info I have available. Thursdays have become my Sunday, I wrote about it a while back. The "sermon" I listened to today was encouraging. Oh yes my friends, one of my better qualities is, I am a very good listener. It's part of being a good teacher. It's a small town around here. I see the same folks week after week. I also get a lot of tourist traffic out of Canada. I'm 22 miles from the border on the only HWY north and south for over 150 miles east and west. As always, a few of them visited the booth today. It is good to put a flyer in the hands of folks that will be traveling many miles with nothing better to do than look at the sky and then look at the flyer. I think "rest stops" would be a great place to set up a table and hand out flyers to travelers. Where there's a will, there's a way, to "take it to the streets". It's the only act that's ever made a difference for change. Often for the good of the many. To "helot", In answer to your question about how can I tell the changes in the "Melodies of the birds". For me, it's quite simple(go figure), Ever since I was a child, I put words to the melody of the birds. Each one had it's own "jingle". so when the "jingle" changed, the words didn't fit anymore, something had changed. The melody isn't quite the same as it once was. Hope that helps. Lastly here, Irene Parousis, I can't thank you enough for sharing your contribution here. Even after I have written my all giblety garb, your words have been the highlight of my day. My fellow Awakener. My thanks to you for this very simple, but powerful message. Yes, I believe we have to talk the talk and walk the walk. My observation shows vast majority do not view this kind of lifestyle as attractive and desirable to them. That is their right to choose. I find myself as being more and more withdrawn from society I did not choose to live among and do not agree with one bit. That is ok too. Your composition is/was the icing on the cake of a very successful farmers market geo engineeringwatch.org awareness booth I tended this afternoon. I got chores done when I got home and opened up this page and there it was. Seems you and I have traveled very similar roads as to how we have changed the way we live on this planet, our one and only home. I'm proud of you and I am proud of myself for the way I treat life and how we live it. "Awakeners", I like that term. Love and strength to you, Irene, my friend I have not met yet. Irene Parousis is certainly right in discussing the condition our Condition is in as the outcome of a disease process. In making such a diagnosis, though, it's essential to distinguish between the disease 'agent' itself, and the complex of symptoms accompanying its process. For instance, Earth is afflicted with a wasting disease that most here call "civilization"….even as most here do not recognize the process they call "civilization" as that of a wasting disease. Instead, most here have been programed to see "civilization" as some kind of Human achievement….even as the greatest thing Humans do. So it becomes difficult to the point of near impossibility for "civilized" Humans to recognize their "glorious" endeavor for the Planet-killing disease that it is right-now on the very verge of (once again) proving itself to be. Meantime, however, it is getting just as difficult to remain oblivious to all the indicators, as noted week-after-week by Dane Wigington and commenters here, of just how dire things already are….and worsening relentlessly, as well. So the trained tendency to seek for answers and explanations, and even possible responses, in ready-to-hand (that is to say "pre-packaged") products of the process itself, intensifies right along with the accelerating disintegration accompanying the terminal phase of the process….which we are deep into here now. In that regard, another helpful observation Irene Parousis offers is her acknowledgement of not-so-long-ago having been among the clued-out (as have most among the "civilized" people) concerning the particular symptom of the disease process often called accurately enough here "climate engineering/weather warfare." In doing so, she very wisely suggests that criticizing and condemning 'others' not yet (and quite possibly not ever) on-to this feature of the wasting disease process, is perhaps a misuse of precious time and attention….maybe even somewhat unfair and hypocritical. Meantime, accurately pin-pointing the actual generator of a disease process is essential to coming-up with any possibly remedial response to its deleterious effects in and upon some actual Living Arrangement….such as a Human or Planetary Body. Otherwise, attempts to address such a condition are quite likely to be limited uselessly to the "whack-a-mole" exercises-in-futility of mere symptom suppression. This in-contrast to finding and 'administering' the remedy specific to the disease and its process. In the 'case' of the wasting disease that is " civilization," for example, the primary "enabler" of its process here is the co-opted and corrupted portion of the Human component of Earth's natural immune system made up of "self"-captivated, domesticated "individuals," who as-such are bereft of the Organic Integrity necessary to fulfillment of our Function in Her Whole Living Arrangement. So a specific remedial response must include a recovery, by a sufficiency of the "self"- sickened, of that Integrity. That recovery begins with getting over the Organically crippling syndrome that "individual"-ization and its "self"-possession induces in afflicted Humans. Only then might they coalesce spontaneously into the Natural Form of our Kind….which us surviving Free Wild Peoples know by specific names, but which is only vaguely approximated in English by the devalued (having been applied to every random collection of the ersatz "individual") term "community." It seems that most here recognize the very near-term DEAD END of any more mere symptom suppression. The most deleterious ones of them have long since all run way beyond "control" anyhow. What is there to lose now by actually sacrificing, finally, the much too-precious (but Organically worse-than-worthless) "self"? Hello, Constant Walker, though I agree that “criticizing and condemning ‘others’ not yet (and quite possibly not ever) on-to this feature of the wasting disease process, is perhaps a misuse of precious time and attention….maybe even somewhat unfair and hypocritical.”…. it is imperative to remember and consider that there is a very big difference between the uninformed, and the willfully blind or outright lying (often in exchange for a paycheck and a pension). The REAL disease is the downright DENIAL on the part of most cultures to train themselves to look ahead in order to avoid creating nasty unintended consequences, like global warming caused by emissions of green house gases. But most humans, with the exception of the First Nations peoples, have not learned this lesson. Civilization should be working FOR us, not against us. Recovery starts with ENDING YOUR DENIALS. And Life is not a "disease." Yes, WE CAN STARVE those "systems" that control the majority of the sleeping population! Starting from eating organic only, and not using most of the deadly medications and household toxic "items" we would bankrupt Monsanto ~~ in no time. Monsanto is playing a huge role in Geoengineering us and the planet. By just changing our ultimately stupid consumers' habits we can change the world, without making a revolution. Many Thanks for your very meaningful intelligent story Irene! Today, targeted killings by drones have become the centerpiece of U.S. counterterrorism policy. … According to the Bureau of Investigative Journalism, a London-based organization that has been tracking drone killings since 2010, U.S. drone strikes have killed between 7,584 and 10,918 people, including 751 to 1,555 civilians, in Pakistan, Afghanistan, Yemen and Somalia. … These operations have continued to grow under President Trump, who oversaw five times as many lethal strikes during his first seven months in office … The administration has also made these operations even less transparent than under Obama, who received widespread criticism on this score. … drone warfare has been largely absent from public discourse. Among ordinary citizens, drones seem to have had a narcotizing effect, deadening the impulse to reflect on the harm they cause. Then again, the public rarely sees or hears about this harm. The sanitized language that public officials have used to describe drone strikes (“pinpoint,” “surgical”) has played into the perception that drones have turned warfare into a costless and bloodless exercise. … interviews that they and other colleagues conducted with 141 intelligence analysts and officers involved in remote combat operations to assess their emotional reactions to killing. Far from exhibiting a sense of carefree detachment, three-fourths reported feeling grief, remorse and sadness. Many experienced these “negative, disruptive emotions” for a month or more. According to another recent study conducted by the Air Force, drone analysts in the “kill chain” are exposed to more graphic violence — seeing “destroyed homes and villages,” witnessing “dead bodies or human remains” — than most Special Forces on the ground. … the focus on brain injuries has obscured other kinds of combat trauma that may be harder to detect but can be no less crippling. Drone warfare hasn’t eliminated these hidden wounds. If anything, it has made them more acute and pervasive among a generation of virtual warriors whose ostensibly diminished stress is belied by the high rate of burnout in the drone program. … Forty minutes north of Las Vegas, Creech is a constellation of windswept airstrips surrounded by sagebrush and cactus groves. It is home to some 900 drone pilots who fly missions with MQ-9 Reapers in numerous theaters. … A chaplain named Zachary told me that what most burdened the airmen he spoke to was not PTSD; it was inner conflicts that weighed on the conscience. … “… moral injury is an essential part of any combat trauma,” he wrote. “Veterans can usually recover from horror, fear and grief once they return to civilian life, so long as ‘what’s right’ has not also been violated.” … killing was a “significant, independent predictor of multiple mental health symptoms” and of social dysfunction. … they expressed guilt and self-condemnation. “You feel ashamed of what you did,” one said. Others described feeling unworthy of forgiveness and love. The passage of time did little to diminish these moral wounds …. … “If you give the warrior, on one side or the other, complete immunity, and let him go on killing, he’s a murderer,” he said. “Because you’re killing people not only that you’re not necessarily sure are trying to kill you — you’re killing them with absolute impunity.” … Another former drone operator told me that screens can paradoxically magnify a sense of closeness to the target. In an unpublished paper that he shared with me, he called this phenomenon “cognitive combat intimacy,” a relational attachment forged through close observation of violent events in high resolution. In one passage, he described a scenario in which an operator executed a strike that killed a “terrorist facilitator” while sparing his child. Afterward, “the child walked back to the pieces of his father and began to place the pieces back into human shape,” to the horror of the operator. Over time, the technology of drones has improved, which, in theory, has made executing such strikes easier, but which also makes what remote warriors see more vivid and intense. The more they watch targets go about their daily lives — getting dressed, playing with their kids — the greater their “risk of moral injury,” his paper concluded. … The secrecy of the drone program makes it riskier for people who have served in it to share their stories. Jesselyn Radack, a lawyer for national-security whistle-blowers who has worked with Aaron, told me that several former drone operators she represents have suffered retaliation for talking about their experiences (she said one client had his house raided by the F.B.I. and was placed under criminal investigation after speaking on camera to a filmmaker). After Aaron began speaking publicly about his own past, someone hacked into his email and his cellphone, and a stream of anonymous threats began flooding his inbox. The hostile messages, calling him “scum” and warning him to “shut his big blabbermouth,” were also sent to his father, whose email was likewise hacked. “One such episode became particularly famous, for it was caught on camera. On March 24, 2015, an Israeli soldier carried out a routine operation by shooting in the head an incapacitated Palestinian. The sanitized language that public officials have used to describe drone strikes (“pinpoint,” “surgical”) has played into the perception that drones have turned warfare into a costless and bloodless exercise. … interviews that they and other colleagues conducted with 141 intelligence analysts and officers involved in remote combat operations to assess their emotional reactions to killing. Far from exhibiting a sense of carefree detachment, three-fourths reported feeling grief, remorse and sadness. Many experienced these “negative, disruptive emotions” for a month or more. According to another recent study conducted by the Air Force, drone analysts in the “kill chain” are exposed to more graphic violence — seeing “destroyed homes and villages,” witnessing “dead bodies or human remains” — than most Special Forces on the ground. … the focus on brain injuries has obscured other kinds of combat trauma that may be harder to detect but can be no less crippling. Drone warfare hasn’t eliminated these hidden wounds. If anything, it has made them more acute and pervasive among a generation of virtual warriors whose ostensibly diminished stress is belied by the high rate of burnout in the drone program. … Forty minutes north of Las Vegas, Creech is a constellation of windswept airstrips surrounded by sagebrush and cactus groves. It is home to some 900 drone pilots who fly missions with MQ-9 Reapers in numerous theaters. … A chaplain named Zachary told me that what most burdened the airmen he spoke to was not PTSD; it was inner conflicts that weighed on the conscience. … “… moral injury is an essential part of any combat trauma,” he wrote. “Veterans can usually recover from horror, fear and grief once they return to civilian life, so long as ‘what’s right’ has not also been violated.” … killing was a “significant, independent predictor of multiple mental health symptoms” and of social dysfunction. … they expressed guilt and self-condemnation. “You feel ashamed of what you did,” one said. Others described feeling unworthy of forgiveness and love. The passage of time did little to diminish these moral wounds …. … “If you give the warrior, on one side or the other, complete immunity, and let him go on killing, he’s a murderer,” he said. “Because you’re killing people not only that you’re not necessarily sure are trying to kill you — you’re killing them with absolute impunity.” … Another former drone operator told me that screens can paradoxically magnify a sense of closeness to the target. In an unpublished paper that he shared with me, he called this phenomenon “cognitive combat intimacy,” a relational attachment forged through close observation of violent events in high resolution. In one passage, he described a scenario in which an operator executed a strike that killed a “terrorist facilitator” while sparing his child. Afterward, “the child walked back to the pieces of his father and began to place the pieces back into human shape,” to the horror of the operator. This is exactly what I was talking about when I wrote that PTSD is NOT the cause of the increase in military suicides, as the "smoke and mirrors" mainstream media WANTS you to believe. It is rather the kinds of things that military personnel are being ordered to do that is causing them to commit suicide in record numbers. So that's what you get, "order followers–" It is a well-known psychological fact that the homicidal are also suicidal and you are proving it. MOST MOTHERS, MOST SOCIETIES AND MOST RELIGIONS DO NOT TEACH THEIR PEOPLE TO TRAIN THEIR CHILDREN UP TO BE COLD-BLOODED KILLERS, LIKE THE DRONE OPERATORS. SO "QUI BONO," KILLING EVERYONE IN SIGHT–?? Excellent personal story, Irene. I never connected the dots until I heard Dane do an interview with Sean of SGTReport.com and then I began to learn more about Geoengineering. I'll say that you are not alone because I have encountered the same deer in the headlights look when talking to them about Geoeingineering. A year ago, maybe longer I spoke with a Military Vet and he confirmed that Geoengineering is real and that the US Government is actively participating in these programs. What I do find offensive are all those so-called experts and members of Academia who willfully deny Geoengineering all the while labeling anyone a deny who challenges their beliefs regarding climate change or global warming, Hypocrites all of them and that goes for Guy McPherson and Jamail Dahr just to name a few. Anyone who looks up at the sky and can say it looks normal is a liar.